This is an interesting paper, and seems to have some contradictions within it. Most of all, you need to very carefully read between the lines when you see its disclaimer that it only considers the E1 pulse effects and does not consider the E2 and E3 pulse effects. The nature of these two subsequent pulses are explained in my article EMP – What It Is and Why You Should Fear It. E3 HEMP effects could be just as disastrous to the power grid, or even more so in some cases, than E1 HEMP. You might wonder why the report omits a consideration of the E3 pulse if it is as significant – or even more significant – than the E1 pulse, and understanding the reason for this helps to put the paper in perspective. My sense is the paper is first and foremost a scientific technical paper about the nature and propagation of the E1 pulse. While it does look at some issues to do with the effects of the E1 pulse, it is primarily intended as a scientific analysis of what it is rather than a focus on the general impacts of an EMP event on our society and its infrasctructures. This report is also puzzling because it shows some maps which appear to suggest the E1 effects would be very limited in range – for example, see page 2-4. But it also shows very contradictory maps which are closer to the map in my article, which was taken from a 1994 US Army report on Nuclear Environmment Survivability. The report also acknowledges the long range effects of the 1962 test on Johnston Atoll. This explosion wasn’t with a bomb optimized for EMP effects, and was at a non-optimum height (250 miles up) but even so, effects and damage was caused in Hawaii, 900 miles distant (page 3-4). 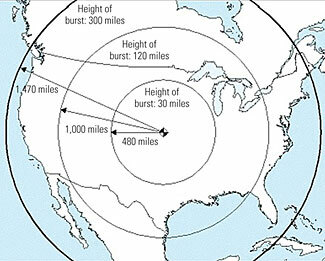 Who knows how much further the EMP traveled – there weren’t other reporting stations to observe the effects. It is also relevant to read the report’s appendix in which it points out that modern day effects of an EMP would be much greater than those experienced in Hawaii in 1962. So, on balance, does this Oak Ridge report reassure and contradict Singer’s warning? I don’t think so, and suggest, instead, that a careful reading of the report, what it does and does not cover, and recognizing it is not in the governnment’s interest to cause public alarm and so it therefore seeks to understate these things whenever possible, would lead one to accept and agree with Singer’s warning.